I don't know what kind of arm Ochocinco has, but Dez Bryant apparently has a great one. Link to a video demonstration at the end of this post. Photo by Navin Rajagopalan. Twitter is a great place to get camp updates but they come so fast and furious, I thought I’d pick a few about players from various beat writers and provide my takes on these quick reports. My Take: I don’t know about Floyd “needing” to be a Raven. Sounds like panicky thinking to me if that happens. Seriously is it just me, or does the Ravens possibly going from Derrick Mason to Malcolm Floyd feeling like settling? Whereas Mason made Joe Flacco look good I think Phillip Rivers made Malcolm Floyd look more desirable as a potential starter than he is. And if Mason can make Joe Flacco look like a QB on the verge of actually becoming a franchise-caliber starter, then a Mason-Santonio Holmes pairing could help Mark Sanchez accelerate his game. Oh yeah, there’s this Burress guy, too. Mason might be the slot-No.3 receiver in concept, but I wouldn’t be surprised if he makes Burress the specialist. My Take: Losing Zach Miller is not just a blow to the passing game, but the run game, too. The left tackle of Oakland’s line last year was 4th in the league in one of those crazy Football Outsider metrics that measure yards gained due to good blocking. The Raiders have lost their LG and TE to Seattle – not to mention the coach who is a specialist in coaching offensive lines. I’d be a little more wary of Darren McFadden this season. He still has the speed to hit home runs, but that line might not be good enough to give him unencumbered swings to get the necessary bat speed. Yeah, I know, clunky metaphor. Hopefully for the Raiders, Boss can be part of the salve that limits a potential decrease in ground game efficiency. @Jay_Glazer: Tiki Barber worked out yesterday w the Dolphins. Heard he looked good, Fins 1st wanna see how their current crop does. My Take: Barber might be a nice plug-in this year but like the NFL, I’m skeptical his good-looking workouts will translate into taking the pounding of a 16-game season at his age. Stranger things have happened though. Hard to think anything he’ll do over the course of a few weeks will be anything more than mirage. Barber was a terrific runner, but the odds are against him of doing more than serving as a role player. My Take: ESPN analyst Matt Williamson retweeted this entry, which should tell you he agrees. Bill Belichick is a master tactician and with all of the hybrid players the Patriots sport (Danny Woodhead, Aaron Hernandez, Alge Crumpler, and Rob Gronkowski), Ochocinco provides the one dimension they’ve lacked after trading Randy Moss: a consistent intermediate and deep threat. 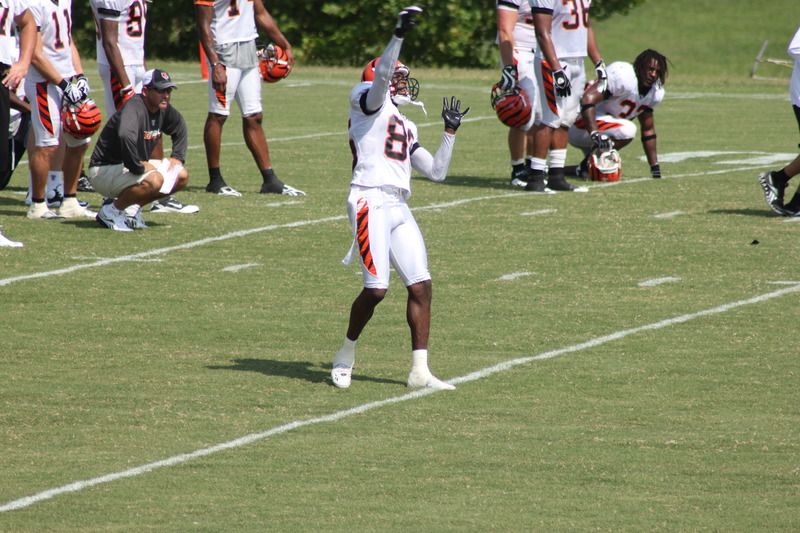 Ochocinco won’t command the same attention deep, but he’s a better player over the middle. Forcing the Jets to plaster Revis on Ochocinco means the Pats will have several kind of blitz-beaters in store for that aggressive Jets defensive unit. The reason is the versatility of those hybrid players to create adjustable formations that Tom Brady can call presnap. What isn’t mentioned enough about presnap decisions is that there are lot of times where quarterbacks may recognize what the defense is doing, but they lack the personnel on the field to change the formation and exploit it. In this respect, New England just shored up a glaring hole at receiver with the addition of Ochocinco. @WilliamsonNFL Haynesworth is already tearing things up. Playing different techniques as interior lineman. Huge. Powerful. Sudden. My Take: I think most fans see Albert Haynesworth’s imminent `11 rebound like we’re staked to the road by our clothing and the steamroller is on its way. Ndamukung Suh might be a more desirable player and teammate, but stat-wise I’d be surprised if Haynesworth isn’t behind him. My Take: Too fun not to post.